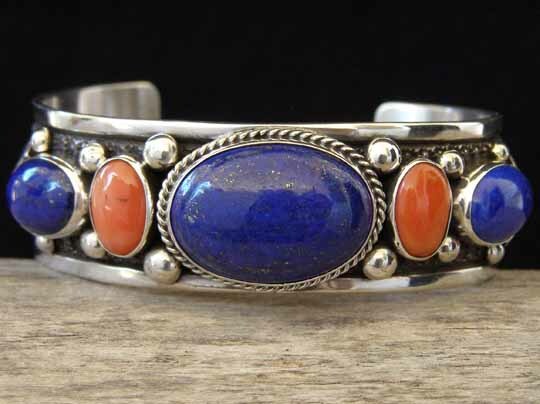 Guy Hoskie Lapis Lazuli & Mediterranean Red Coral Row Bracelet size 6 5/8"
This uniform-width row bracelet made by Navajo silversmith Guy Hoskie is set with ovals of natural, untreated Lapis Lazuli in combination with ovals of Mediterranean red coral. These ovals of stone and coral are set in smooth bezels and the center oval of Lapis Lazuli is wrapped with twist wire. Guy added fat raindrops between the settings along each edge of the cuff to add sparkle to his design and framed this row of five ovals with fanned scallop appliquées. The cuff is additionally decorated with banded stripes of stampwork to the terminals. Lapis Lazuli: center 1" x 11/16"; 2 ovals 9/16" x 3/8"
Mediterranean red coral: 2 ovals 1/2" x 5/16"